Margaret Jane Wilder was born April 17, 1882 in Juniata, Michigan the eldest child of Frank Wilder, Sr. and Julia [Barber] Wilder who was an area farmer. She had a younger sister Bessie born in Mandan after the family moved to Mandan in 1889. Her father moved the family to Mandan and established a newspaper The Mandan Independent later known as the Mandan News. It would later merge with the Mandan Pioneer newspaper. He would eventually leave the newspaper business, work for the state penatentary, and move over to the ND Secretary of State's office and eventually finish as Deputy Secretary of State. Margaret grew up in Mandan. On January 6, 1902 she married Charles Olonzo Welch. He was a photographer and they ran a business together "The Welch Photography Studio." Shortly after their marriage, Mr. Welch accidently shot and killed a young boy. He was not charged with a crime. Charles also reportedly operated the first "moving pictures" business in the western part of North Dakota. In 1907, Charles abandoned his pregnant wife and young daughter Ruth. Welch resurfaced in Beach, ND and lived there and operated a photography studio until his death on May 29, 1919. Margaret's father placed a notice in the Mandan Pioneer newspaper saying Charles had told his wife he was going to Bismarck to take photographs. That was the last communication they had from him. Charles left his family with only $3.10 in the bank and a string of debts around town. He left with their greatest item of value, the camera and lenses. Mr. and Mrs. Wilder opened their home back to their daughter and grand-daughter. Francis "Frank" Welch was born several months later on November 24, 1907. For several years, Margaret made a living taking photographs, predominately protraits. In 1905, Margaret won a photography contest sponsored by the national magazine Word and Works published by Ira Hicks for the best collection of clouds. The first prize she was $25 (approximately equivalent to $1000 in 2010). 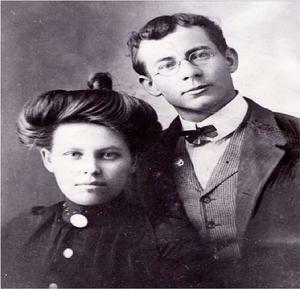 Margaret was married again to James Naylor of Mandan who was 28 years her senior. The couple had two children, John and Dolly. Mr. Naylor died on June 28, 1923 of influenza. Margaret fought cancer of the stomach for nearly 10 years. She died at the age of 41 on November 18, 1923 at her father's apartment at 606 West Main in Mandan. She is buried in Mandan's Union Cemetery next to her mother.